By Jason Kim: 6’1” Paul Williams (40-2, 27 KO’s) faces 6’1” Nobuhiro Ishida (24-6-2, 9 KO’s) next month on February 18th in one of the rare fights where Williams takes on someone as tall as him. Throughout his career, Williams has consistently had a big height and reach advantage over his shorter opponents. However, next month he’s going to have to deal with a guy that will be looking him in the eye and it’s going to be interesting to see how well Williams does against that kind of opponent. To be sure, Williams will still have a huge 10 inch reach advantage but it remains to be seen whether Williams will benefit from that. He certainly didn’t his last fight against 5’9” Erislandy Lara, who punished Williams all night long and gave him a tremendous beating. Williams won the fight by a 12 round decision but he lost the event. Lara was clearly the better fighter and the one that boxing fans were talking positive about afterwards. Williams, #5 WBA, #6 WBO, #7 WBC, #13 IBF), has taken far too much punishment in his last two fights. 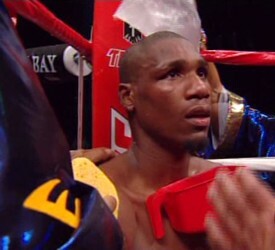 Williams was knocked out cold in the 2nd round by Sergio Martinez in November 2010. Williams then took off eight months and came back for the Lara fight and looked just as bad in taking a terrible beating. Now you have to wonder whether Williams is a shot fighter. Some fans think Williams’ problem was that he had problems with Martinez and Lara’s southpaw stance. But Williams was also having problems in his four round fight against Kermit Cintron in May 2010, and he fights out of the orthodox stance, so you can’t lay all the blame on Williams’ difficulties with southpaws as being the root of his problem. Ishida has looked sensational in his last two fights, knocking out James Kirkland and Edson Espinosa in 1st round knockouts. Ishida tinkered with his style of fighting and came out fast in both of those fights and basically overwhelmed his opponents with fast shots with good power behind him. Ishida never fought like that before, but like Sergio Martinez, who had a late career change from a boxer/puncher to a pure puncher, it seems to be really out well for Ishida. Can Ishida do the same to Williams that he did with Kirkland? It’s doubtful but it’s worth a try because Williams was destroyed early by Martinez in a 2nd round KO last year. If Martinez can do it, a huge middleweight like Ishida might be able to do it as well. Ishida is naturally big and he’s not just tall. Ishida is a big fighter with sneaky power. He could take Williams out if he can get him into a war.